Today’s staff blog post comes from Fran, our Projects Supervisor and is all about Hackney where she is from! Alternatively, it was always the place to go if you fancied being mugged and you could almost guarantee this occurring if you got on the wrong bus and accidentally found yourself in the postcodes E8 or E9! In later years, Hackney was best known for its part in the London riots and the rather depressing fact that the main shops that got raided were Primark and JD Sports – at least they left the pound shop in one piece! As you can see, Hackney has never been renowned for churning out the highest standards of education in London! However, these days Hackney has gone right up market, mainly due to the London Olympics being right on its doorstep and so close to the City of London (that’s the Olympic thing in the distance). House prices are astronomical and you couldn’t rent a public toilet cubicle for less than £600 a week. Hackney is now a thriving multicultural place comprised of an interesting mix of old time Eastenders, drug dealers, people selling random crates of fish and ultra trendy young people who have completely invaded the place with beards, bald heads and cafes that take half an hour to create a fig leaf pattern on the top of your £4.50 cappuccino! 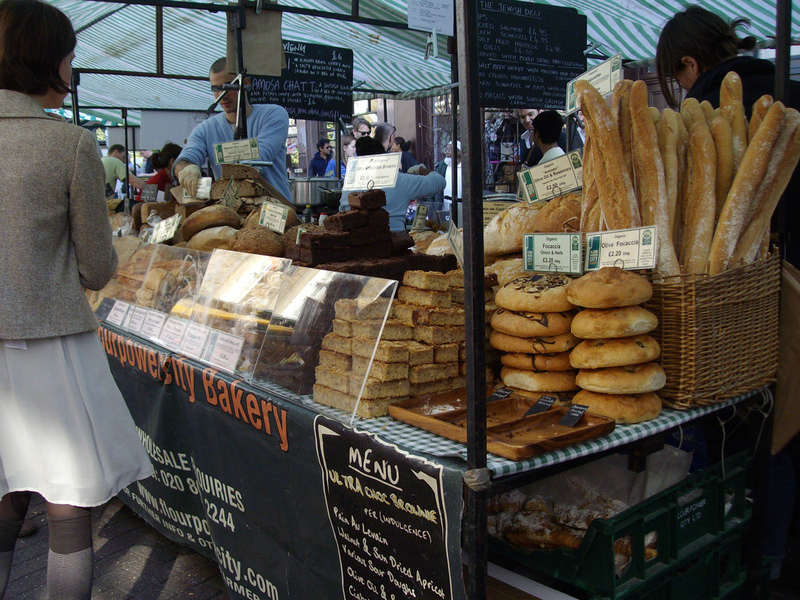 Broadway market is a great pace to go for interesting food, gluten free everything you could possibly eat, vintage clothes and reclaimed art outlets – this is the epicentre of Hackney trendiness, if you like that sort of thing! There are some amazing cafes in Hackney doing amazing food unfortunately at amazingly extortionate prices. I nearly had a heart attack when I went in one for breakfast with my son and his wife and the bill came to £38!! But it is true to say that the food is brilliant and I quite like the fact that you can get a Bloody Mary with your breakfast if you want. It’s hard to tell from its exterior, but the Well Street Kitchen, above, is one of the most popular cafes in the area and people come from all over London to eat Sunday brunch there. Forget attempting to pop in for a cup of tea and a ham sandwich as there is usually a 2 hour wait for a table! Like many cafes in the area, it is sporting the “found interior” look where the seating is made of mismatched bits of wood, old bike wheels and dodgy plastic fruit boxes! For one view of the invasion of Hackney by these people, this video pretty much sums it up! Well Street itself, is a hub of vitality and still has at least one old cockney geezer selling plants! It also has one of the best butchers ever, and it has been there for about 80 years. On a Saturday there is always a queue down the road for it and you can get any sort of meat you want in there. Apparently (according to my neighbour!) Robbie Williams still gets his meat delivered from the Well St Butchers. Going further up Well Street you have graffiti corner and still some good old fashioned pubs that have not yet been turned into gastro bistro real ale places, although there seems to be some worrying building work going on here so probably next time I go back it will have become an oxygen bar or something. The Kenton Arms is a great pub with a very interesting beer garden and won last years Time Out Awards for “Best loved London Pub”. (However I happen to know they were giving away free shots at the bar for everyone who voted online for them!) Still worthy winners though! This is the bar manager Maddy, (with my neighbour, Baby who I said I’d give a special mention to). Maddy reminds me of Anabel [one of Pexel’s Project Managers] in many ways, but mainly by the interesting array of tattoos she has and the fact she is a closet Millwall supporter in a staunchly West Ham area! She’s a very capable woman and regularly chucks people out if they fall asleep under the blankets in the outside bit, but also gives away free shots if she is in a good mood! Finally to really encourage everyone to go there, here’s a few of the regulars on a night out! To be fair, the one in the middle is in fancy dress, but the other two just look like that! The other main great thing about Hackney is that you can buy alcohol 24 hours a day from public spirited establishments such as this one, at the bottom of our flats. Just to finish here a picture of my sons ex-dog Bruno outside our flats and a picture of him when he’d just had the chop because he looks so proud with his bucket head! And finally, just to finish where I started with a bit of culture, this extract from the Hackney Gazette. Hackney teens take to the stage in groundbreaking Lord of the Flies dance production. Ed Munro, 16, and Ricardo Walker, 19, took to the stage at Sadler’s Wells in Rosebery Avenue, Islington, with 21 other young performers chosen for [the] theatre’s four day run of the show based on William Golding’s iconic dystopian novel about a group of schoolboys abandoned on a desert island. Here is a quote from the illustrious writer himself!